Swiss authorities have blocked the sale of an ancient clay tablet, thought to have been smuggled from Iraq, on the internet auction site eBay. A German archaeologist spotted the 4,000-tear-old tablet on eBay's Swiss site. 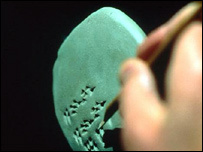 It is carved with cuneiform - one of the oldest known types of writing. Swiss authorities were alerted and eBay stopped the auction minutes before the end of the bidding deadline. Police confiscated the tablet at a storage facility in Zurich. Swiss officials said that criminal proceedings have been started against the seller, who has not been named but faces a fine of up to 500,000 Swiss francs (300,000 euros) or a prison term. Switzerland has a ban on trading Iraqi cultural artefacts exported from the country after 1990. Yves Fischer, a senior official in Switzerland's culture department, said the tablet had been offered at a starting price of 250 euros ($360) on eBay but it was not clear if any bids were made. Cuneiform tablets are on a list of endangered Iraqi cultural objects drawn up by the International Council of Museums. "This Mesopotamian cuneiform tablet has an invaluable historical value," but the seller "could have acquired it for less than 300 euros," Mr Fischer said. "If it's a tainted object, then the goal will be to return it to Iraq," he added. The tablet has not yet been deciphered. Cuneiform tablets were used throughout the Middle East and ancient Persia for recording the deeds of leaders as well as correspondence and book-keeping. The Iraqi National Library and the country's National Museum were both heavily looted in the days following the US-led invasion in 2003.